Desayuno de los Pollos/Breakfast of the Chickens | ¡VidaMaz! Our group driving into a neighborhood on Christmas Eve morning as part of the Desayuno de los Pollos project. Since 2007 we have had the privilege, as a family and with families of friends, to participate in Desayuno de los Pollos. It is the BEST way to spend a Christmas Eve morning that you can ever imagine! If you have not yet participated in this homegrown, very powerful effort, now is your chance! Delivery schedule in 2010. 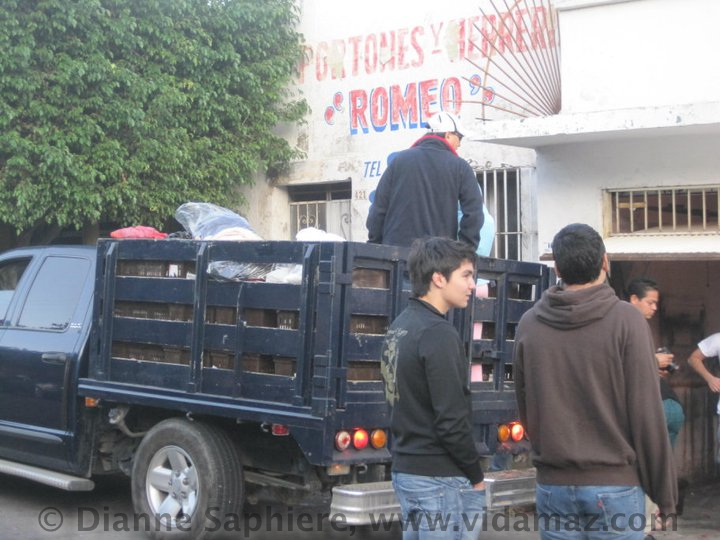 As you can see, more than 2000 chickens go out to familias necesitadas. 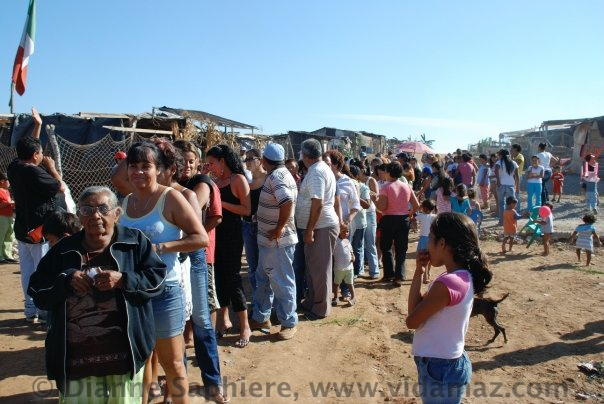 Over 2000 whole chickens and 7-10 days’ of food are given out to families in need in the poorer areas of Mazatlán. Before we participated in this project, we hadn’t even known about some of these neighborhoods. 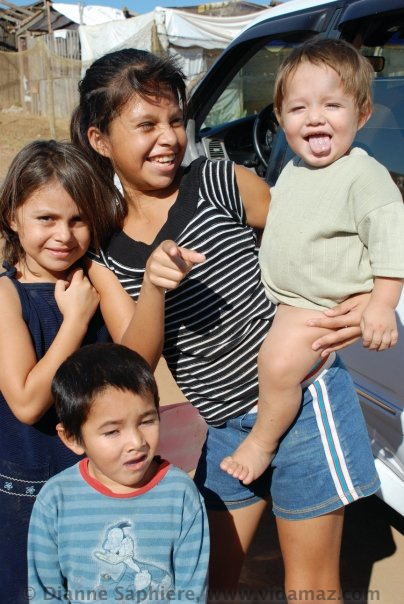 A group of kids in one of the communities wait their turn to get clothes and candy. 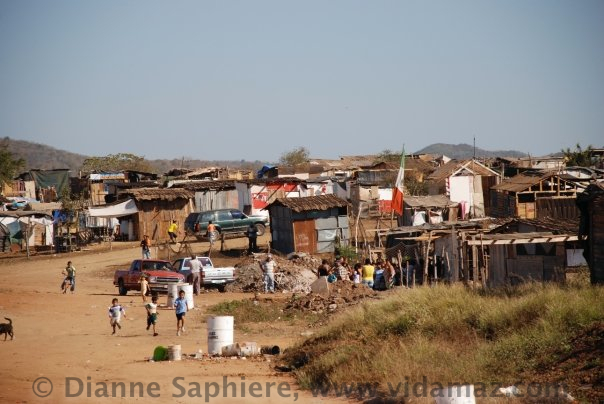 As in most any city worldwide, amidst the luxury you can find extreme poverty. 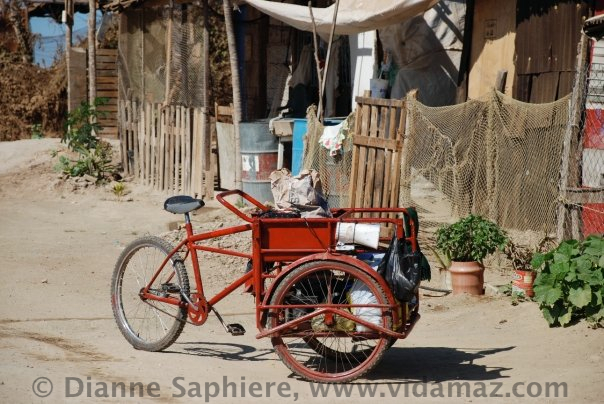 These colonias on the outskirts of town do not have power or water, and the homes are cobbled together mostly with scraps of wood and metal that residents have been able to find. 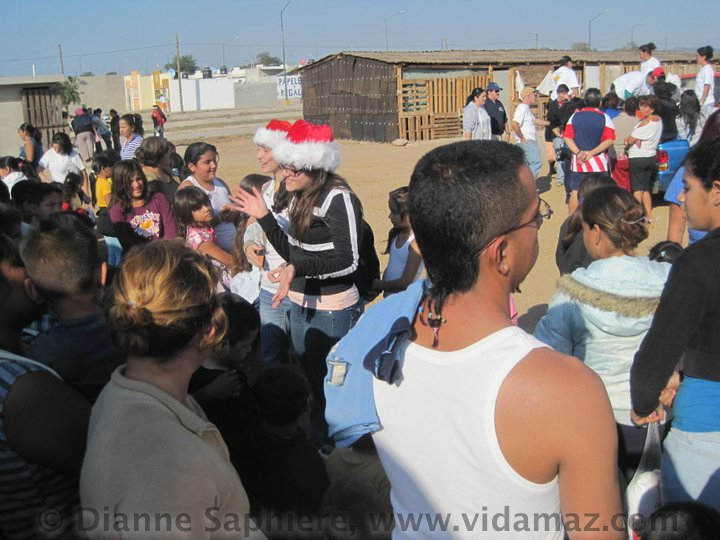 The dignity of the people is beautiful to witness, and they are so grateful for the food, the love and joy we bring, as well as the clothing, candy and toys that many of us also collect to hand out that day. You may know my friend Yolanda Medina. She sells crafts in the Plazuela in the evenings. She is Jorge Medina’s sister. You may know Jorge from Rotary or from his ironwork business, Quince Letras (that’s the area of town the family lives), or his wife Isa, who is very active in our bilingual community as well. 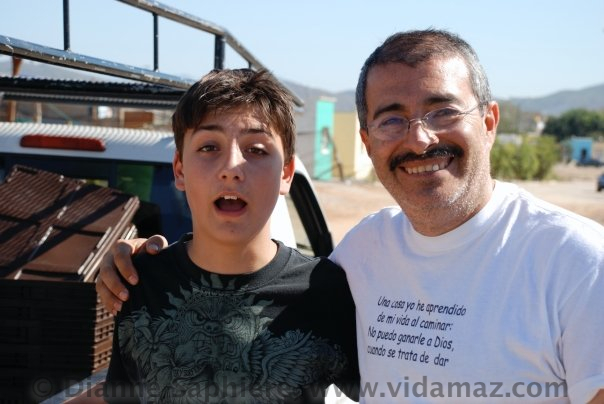 Jorge is on the right, with our goofy son (a few years ago) on the left. 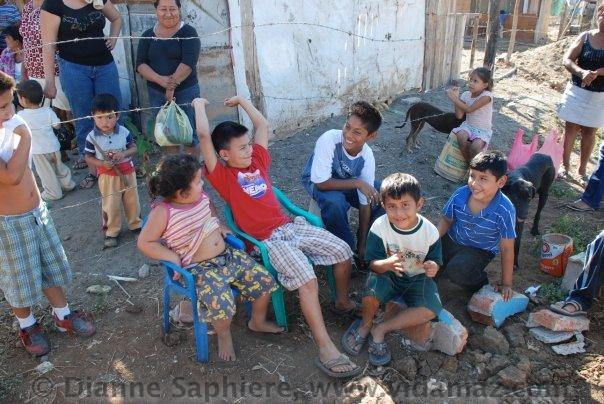 Happy kids in one of the communities during Desayuno de los Pollos on Christmas Eve morning. 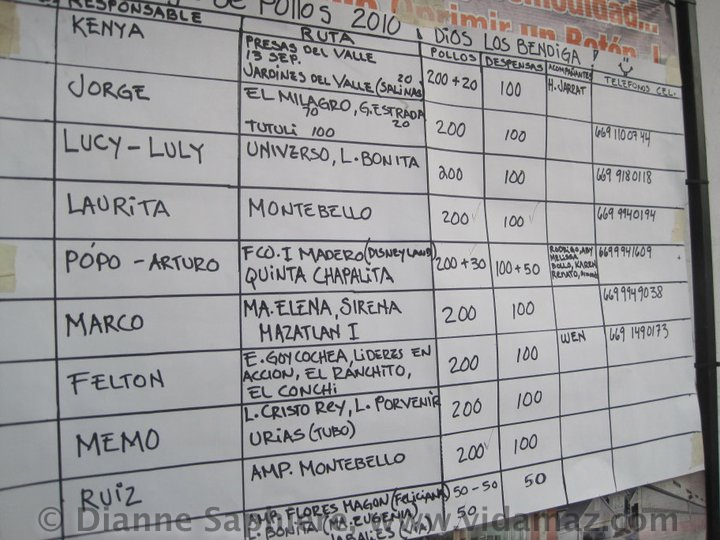 The Desayuno de los Pollos project has been written up in the local newspapers the last few years, and has really grown every year we’ve participated. 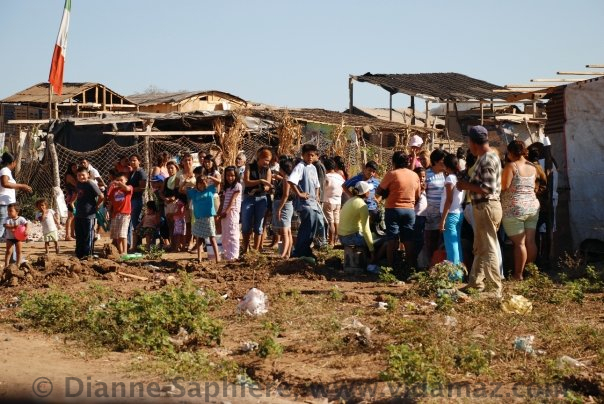 It is a true community effort, with aid now from the food bank (Banco de Alimentos) and Protección Civil. This woman, first in line, was 87 years old when I had the pleasure of giving her a chicken a couple of years ago. She told me her husband was 93. 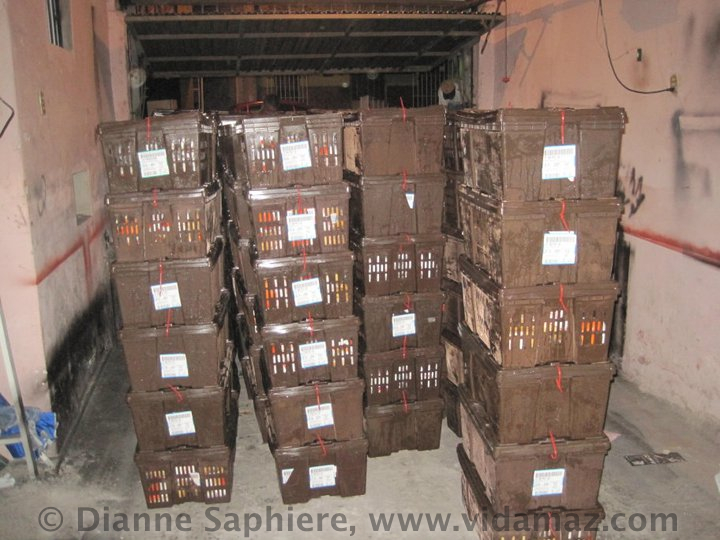 What funds this ability to buy whole chickens and kitchen staples for 2000 families? A breakfast. Yes, a simple breakfast. This year (2012) that breakfast will be held on Saturday, December 8, from 8:30-11 at the API dock/cruise ship dock. Tickets are 150 pesos. The breakfast is served by local teenagers who volunteer their time, and your ticket includes a raffle and entrance to a Christmas handicrafts bazaar. It’s fun. Even if you can’t attend, please buy some tickets or make a donation to this very worthy cause. 100% of your donations go to those in need, as everyone involved volunteers their time and talent. 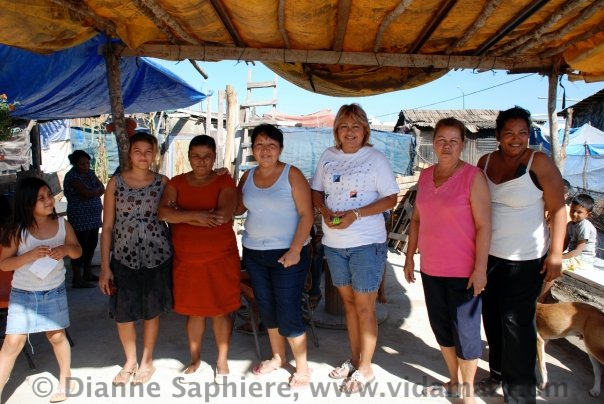 A couple of years ago we didn’t have enough money, and Yolanda borrowed $600 from her now-deceased mother in order to buy the required chickens. Let’s get the funds we need for everyone to eat this year! One truck is loaded and ready to go. If you have access to a truck early morning on December 24, let us know as we could use your help! We hand out the supplies in big convoys to 5-6 different colonies on the 24th of December, starting about 5 or 6 am when we begin packing, sorting, and loading. Anyone coming can bring candy for kids, used good condition clothing to hand out as well. Wear Santa hats. It’s well organized and very humbling. The people receiving the food so need the help, and have so much dignity and gratitude. It’s beautiful. 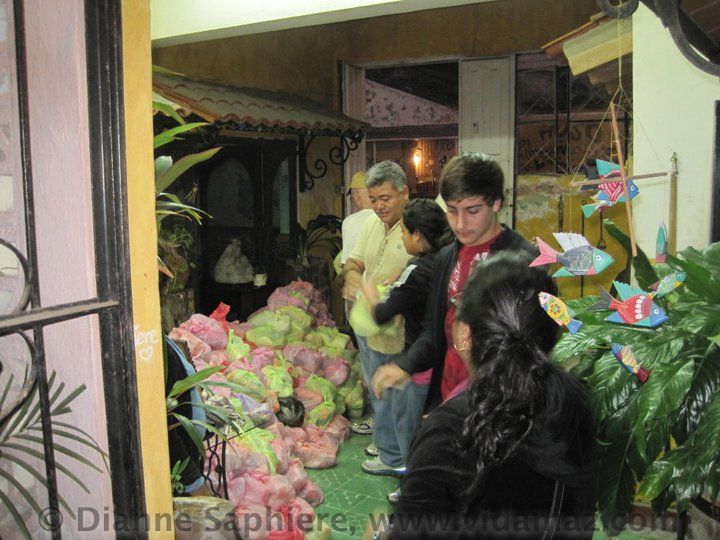 The plastic bags are filled with despensas or food staples. This is the loading line, moving the food from the house to the trucks outside. 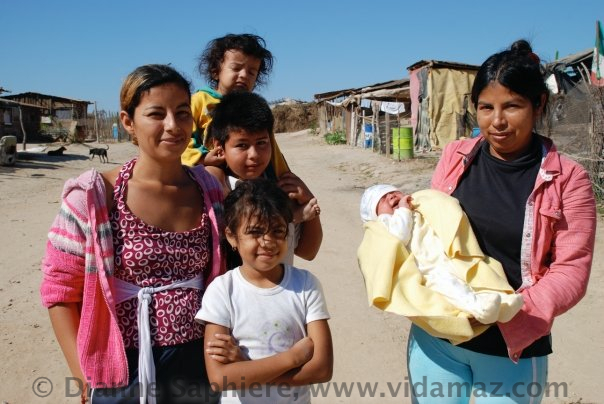 Yolanda, Isa, and others go out to the colonias a week to ten days ahead of time, to meet with community leaders and organize things, to be sure that every family in need gets a ticket for a chicken and staples. And, so that things are fair, to ensure that some families don’t double dip. It is all incredibly well organized, efficient, and filled with joy. 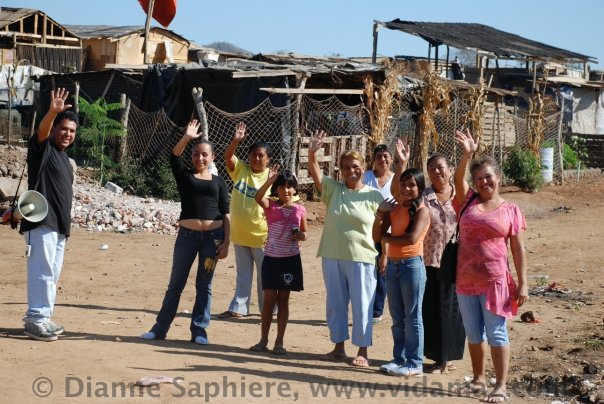 We are fortunate in Mazatlán to have so many groups and projects designed to help others. This one doesn’t have a formal group surrounding it, more an extended family and friends who come together each year in incredible ways. Contact me (Dianne) for tickets to the breakfast or to donate items (dianne@vidamaz.com, or cell 6691-22-8962), in English or Spanish. 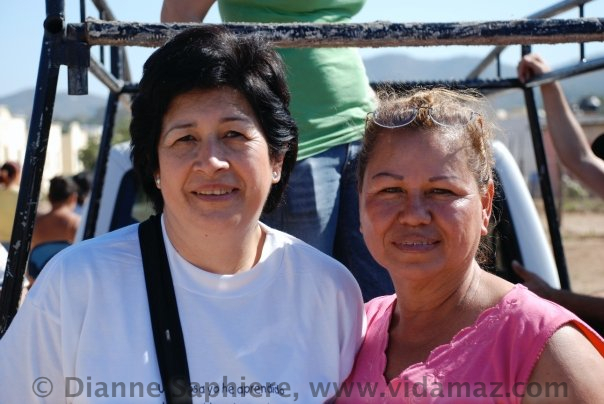 If you know Yolanda, Jorge or Isa, you can always contact them, too. There will be breakfast tickets at the door on December 8, if you prefer to just show up. If you are able to save your (gently) used clothing and toys for this project, or you or someone you know can donate toys, clothing, or food, or who has a truck to drive on December 24, please let us know! Smiling kids are always a joyful sight! Two Santa Clauses handing out candy and toys. It is a good lesson for kids about helping others whenever we can. We do hope you’ll join this project and help us bring joy to more families in need during the holidays. Thanks! The scene in the living room a few years ago prior to loading the trucks. 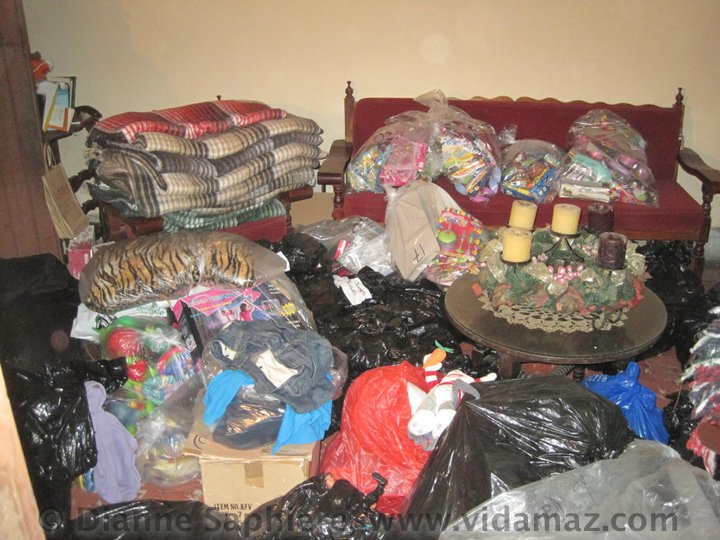 This room is filled with clothes, blankets and toys. The garage filled with whole chickens, delivered that morning frozen solid. We have to get them in the hands of their recipients quickly, before they melt. Most people tell me they cook them in a pot of water over a fire, though there are those occasionally who tell me they’ll roast theirs over an open flame. Pingback: Want a Free Stay at Marina El Cid Luxury Resort? | ¡VidaMaz! Pingback: Incredible Prizes and Silent Auction Items for Desayuno de los Pollos! | ¡VidaMaz! Pingback: “Chicken Breakfast” 2014! | ¡VidaMaz! Pingback: Definitely Feeling like the Holidays! | ¡VidaMaz!